Looking Directly at the Sun. 29,717 others viewed this post. 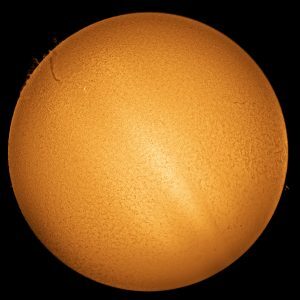 I’ve wanted a hydrogen alpha solar telescope ever since I learned about them. They block all but a small sliver of the light spectrum allowing you to peer into the otherwise blinding light and look at the roiling surface. 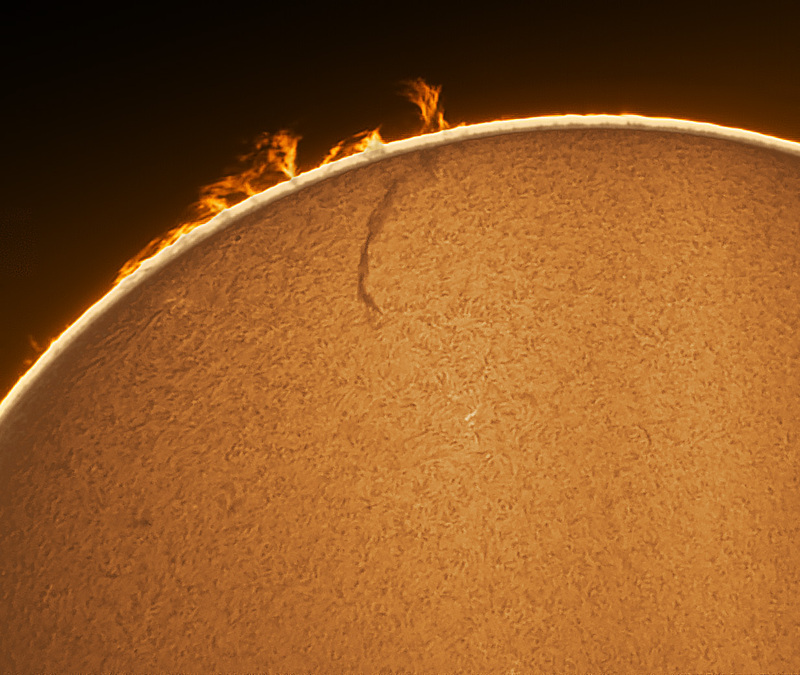 I took this image of the Sun this morning as a first test of this little dinky “Coronado PST” 40mm dedicated solar scope. It’s small enough to hold in one hand, so I was very impressed to get a result like this on the first try. It’s probably the cheapest Ha solar telescope of it’s class and this kind of imaging can get very expensive, but this little thing will let me observe solar events and do some daytime astronomy for science outreach at schools and such. Seen here is a “hedgerow prominence” on the edge of the sun, where loops of plasma (not fire) twist and buckle against magnetism and gravity. Occasionally they will rip, sending a flare off into space. Tech stuff : Using a powermate 2.5x magnifier and the high speed ZWO 174mm I can create a single frame like this one, and then take several of them to stitch together a full disc image of the Sun. This was a rough first try so it’s a bit unevenly textured and illuminated but I should be able to get the process down better soon.